When applied with the concealer brush provided in the kit, this gives great coverage. I would definitely recommend it, but the brush is key. I got a sample size of this and I'm surprise it actually works. It doesn't cover dark circles and acne scars perfectly, but it does show a significant different. I like it a lot so far! Summer bisque is a dream! I got this sample in the TryBelieveLove kit at Ulta and loveee it! This concealer is very lightweight, covers my redness without looking like I caked on concealer, and the little concealer brush that comes with it makes it look natural and beautiful. 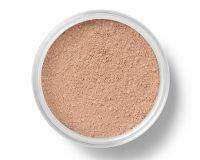 It was very interesting to know this is a concealer as it is a powder, but trying is always the best thing to do, because it is a great concealer! !...read more I dab a little on the mini brush it comes with and lightly brush it on my redness above and below my brows, and my cheeks.